My daughter, grand-daughter and I just adored this book. 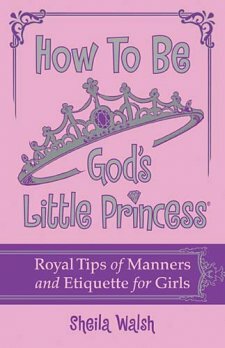 The girls just LOVE to be interactive and this book includes their thoughts while teaching them the proper etiquette and manners enabling them to be beautiful inside and out. I can already see a difference in my daughter, for the first time EVER she allowed her brother the choice of games to play instead of exerting her own control over the situation. I also enjoyed answering the girls questions concerning God and being able to reinforce his love of them. Their little faces were beaming and I swore I could see God shining through them. I love how 'How To Be God's Little Princess' is FULL of positive reinforcements, on every page, in every paragraph your child is reminded that they are truly loved and are absolutely perfect just the way they are. I would LOVE to see a book for boys "How To Be God's Little Prince", my son would have participated but everything was for girls and he got a little perturbed and I had to tell him that God loves him too and listed all the reasons why (I just read a few pages from the book and used the masculine for it, he seemed pleased). A very sweet book for the little princess in your life reinforcing the good in your young ones while reminding them of God's love with biblical quotes to support this fact. But wait! There’s more … On May 4th join Sheila at her Author Page on Facebook for the Princess Tea Party! She will announce the winner of the KINDLE, connect with readers and give away a ton of fun products from the Gigi and God’s Little Princess line! Tweens invited! Don’t miss the fun! She is looking forward to connecting and learning more about you – so be sure to stop by on May 4th at 5:00 PM PST (6 PM MST, 7 PM CST, & 8 PM EST). Want to win your VERY own copy to give to that little princess in your life?? Then please follow the directions below and have fun~!!! 1st Mandatory Entry - What manner or etiquette tip did you learn as a child that you instill in your own children today. Giveaway begins Sunday April 17 12:01 a.m. (EST) and ends on Saturday, April 30th midnight (EST). This contest is open to the US and Canada. The winner will be selected at random.org and then announced on One Day At A Time and contacted via email. The winner will then have 48 hours to respond before a new winner is selected. I learned and still practice that you have to stay at the table until the dinner is finish, if you want to leave you have to ask! I'm trying to instill to my children everything I learned. Say, May I please have, thank you, no thank you etc. I also like my son to open the doors for women and he knows to put the lady on the inside when he walks on the sidewalk. I also have my boys stand when a lady leaves the table. My daughter is learning to sit with her legs crossed as well. There is no reason children should have manners. They should be taught from the beginning how to be polite and nice. People appreciate it when your children are well behaved in public places like restaurants and stores. I learned to say Please & Thank You as a child and instill the same in my children. Hi: My mom taught me to be polite and to say please and thank you. Also manners,at the table. I follow Mad Moose Mama Google Friends Connect. To say please and thank you. I like Sheila Walsh on facebook! i Network Blog Follow One Day At A Time! Thanks for so many opportunities to win! i submitted a link to the giveaway on "all things bloggy"
entered your GlowCrazy Review and Giveaway! yay! To say please and thank you. It goes a long way! I teach my children to say please and thank you. The importance of saying please & thank you was something I instilled in my daughter. I entered your zipbin giveaway. I entered your glowtoy giveaway. There are so many manners that I want to instill in my daughter and even though she just turned 1 yesterday we practice please and thank you, and table manners. Saying please and thank you...and to wait your turn. always say Maam and sir and please and thank you! the southern way. I tell my children to always say please and thank you. I also tell them to wait to talk until the person they want to talk to is done talking. I follow Mad Moose Mama on Twitter. I follow Sheila Walsh on Twitter. I entered your Non Toxic Mystic Paint giveaway. I learned and I'm teaching my girls "its not what you say, its how you say it"
Table manners were instilled in me early and fiercly! I follow Mad Moose Mama on GFC as Ericka T.
I'm a big believer in please and thank you. I befriend Mad Moose Mama on Facebook as Ricky Todd. I like Shiela Walsh on Facebook as Ricky Todd. I follow Mad Moose Mama on twitter as humanecats. I follow Sheila Walsh on twitter as humanecats. Please and Thanks yous, and excuse me.